I walked south along the main road until I could cut in and head towards Craobh Haven which is a large mooring area for yachts. It had a pub and a café but looked a bit out of place as the houses at the back which I presume were holiday houses, were painted in pastel pinks and yellows which wouldn’t have looked out of place in the East Neuk of Fife, but looked unnatural here. This is definitely yachting and sailing country and there are many villages that are set up to cater for the sailing fraternity. Later I was going to meet my sister Lorna who had kindly agreed to head over to see me from Perth and to walk with me tomorrow. We agreed to meet at the end of the Peninsula at Craignish Castle at 5 pm. Unfortunately due to unforeseen circumstances, Lorna didn’t arrive till about 6.30; which wasn’t really a problem as I just sauntered back along the road from the castle. I enjoyed having a look at the old gravestones at the ancient Kirkton Chapel. This area, especially immediately south of here in Kilmartin Glen is a fascinating place with artefacts ranging from 4000 B.C through to the 14th Century. 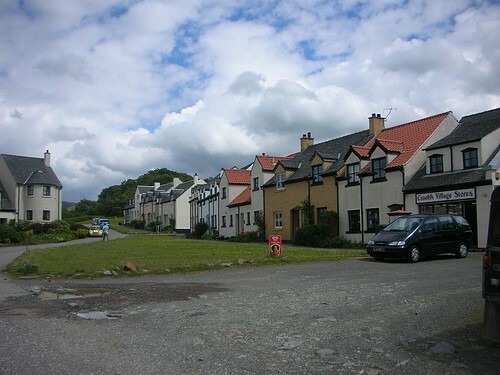 Ardfern where the walk ended is a lovely little village with an nice coffee shop and hotel opposite. Sometimes I walk through a place and I think – yeah – I could live here. This was one of these places. This entry was posted on Wednesday, June 18th, 2008 at 11:48 pm and is filed under life, photography, Scotland, trail, Travel, trek, Uncategorized, walk. You can follow any responses to this entry through the RSS 2.0 feed. You can leave a response, or trackback from your own site.